Want to roll out the best perks program your company has ever seen? Then you’ll need to become a master planner, listener, communicator, and exercise your stakeholder communication and buy-in skills. No worries though, whether you're building a program from scratch or improving upon an existing one, we’ve got you covered. Before you can begin setting goals and picking what employee perks to offer, you should have two things: 1. an understanding of what you’d like to achieve by providing employee perks, as well as 2. your budget. Defining these two at the onset will provide the necessary context for the rest of the process, and will ensure you’re being realistic and remain hyper-focused throughout. What are we trying to accomplish with our perks program? What resources (monetary, information, support, and beyond) will we need to accomplish these goals? Once you've answered the questions above, it's time to set some concrete goals. You can use the framework your company follows for goal setting, and if they don't have one yet - consider the SMART goal setting framework or OKRS. If you're finding it hard to set goals, take a few minutes and write out as many reasons as you can list as to “why” you’re building a perk program or updating an existing one. Most people won't write out the reasons, but in there is where the clarity and motivation you need to succeed lies. Include a vision for what kind of company you’ll help create and person you’ll become when you set these goals an achieve them. If that doesn’t help, try to find ways to make the goal setting process, or the goal itself, fun. When things are enjoyable, we're much more likely to see them through to completion. Once the goals are defined, you’re on track. Your thoughts, decisions, and what you choose to act on will have an outcome in mind. You’re also less likely to get sidetracked by other commitments, responsibilities, or requests that come in. Next up, complete an analysis of what’s currently in place. 2. Complete a stop, start, continue, change analysis. Free coffee, snacks, happy hours, coffee baristas, and more. Chances are, you already offer some perks to your employees. Before you add more to the equation, you should review the perks already in place and determine if they’re worth continuing, changing, or stopping altogether. Ever heard of the start, stop, change, or continue framework before? It’s a popular change management framework used by companies everywhere who want to complete an analysis of a program or service. We recommend using this framework for this process. However, we know you might be tempted to use an Employee Engagement Survey instead. While many companies use them, and most often once a year, they're often trying to learn multiple things at once and solve multiple HR goals. If you're developing a perk program from scratch or rebuilding one, we recommend taking a different approach, one that is more targeted to learn usage, determine ROI, and gain feedback directly related to your employees and their wants and needs for their perk program. Remember, get feedback from employees. To make this the best program your employees have ever seen, it’s best to get the input from as many people as possible. Think about it; a product manager would never develop a product without talking to their users. A designer wouldn’t roll-out completed designs without doing UX research first. A marketer wouldn’t create content without talking to prospective customers to identify their problems first. This is the same thing, except your stakeholders or "customers" are your employees. We know it can be impossible to get input from everyone, but if you do go beyond your immediate HR or People Operations team to gain insights, take it one step further and set a goal for how many people you’ll survey and which areas of the organization they’re from. Approaching this analysis with purpose and thought will ensure more success in the end. As Abraham Lincoln once said, "Give me six hours to chop down a tree and I will spend the first four sharpening the ax." What is not currently working in our organization? What perks no longer serve their original purpose? What perks no longer align with our company’s values, purpose, or goals? What are perks that we can confidently state are no longer adding value to employees lives? What are perks which take too much time, money, or energy and have low adoption? What is working so well that we should consider increasing spend, availability, or find complementary perks? What’s working but not as well, so we should consider decreasing, spend, offering, etc.? Question directly for HR team: What is something that works but should be adjusted based on feedback, or be repositioned based on new company direction, goals, etc.? What should we have in place to improve our organization’s perks? What are perks which align with our company’s values, purpose, goals, or new focus? Question directly for HR team: What are perks which our employees have stated they want via previous feedback surveys? If you want to learn more about completing an analysis like this, here is some helpful reading. If you are looking for some ideas for new perk programs or company initiatives, check out our Company Culture Index for inspiration. Once you have all the different areas of the stop, continue, change, and start the framework completed, run the idea by people in the organization. Doing this serves two important functions: 1. You get feedback directly from employees and 2. You are able to help get people on board before you roll it out company-wide. Having people who can communicate the benefits of the new perks and champion them on your behalf will go a long way in company-wide adoption. Ask people you see getting coffee, walking to meetings, passing by in the bathroom to get a pulse check. It’s imperative that programs are not developed in a vacuum. Proactively schedule meetings with managers, groups of individuals, and people who are exceptionally connected internally or are influencers within the organization. You might even consider posting something on your internal wiki letting the team know that you’re coming to the final stages of perks and benefits planning and would like some input on what you have so far. Ask if there are people who are passionate and want to provide feedback, and then use this to set up meetings. 4. Develop a communication plan to highlight decisions. We’ve all been there; a decision was made at the company which impacts us directly and we weren’t asked for our input, feedback, or even told how the decision was made. It’s pretty frustrating. Fortunately, if you’ve followed the steps above, you’ve avoided the first two issues above, and now it’s time to close the communication loop. Explaining the decision-making process will go a long way in helping your team understand why and how you went about selecting the perks and setting their expectations. When communicating the new program or new details, remember to write with your audience in mind, and communicate the “what, why, how, and when” details. An excellent way to communicate the team's new perks is on an internal wiki like Atlassian or Tettra. With that software, people can leave comments, ask questions, or “watch” the page to stay in the loop for any updates that might happen. When you share the amazing new perks program details, a best practice is also to set up a few blocks of time that you’re available, a la office hours, so that you can address any questions folks have. Another best practice is to remind people of your goals and that you’re always welcome to feedback - either in person, via email, or they can add it to your company pulse surveys. 5. Follow up with advocates and naysayers alike. As you launch this program, there are bound to be people who like and dislike the new perks. That’s normal. It’s important to acknowledge any and all feedback, even the naysayers because it means they’re engaged. According to the book Buy-In: Saving Your Good Idea from Getting Shot Down, responses to objections must be short, clear and based on common sense. Long responses give people’s minds time to wander, and complex answers add to the confusion. Objection 3: "I don’t like the perks we’re investing in." Note: If you face any of these objections on a regular basis, it’s likely to be a sign of greater change at your organization as the workforce expectations are shifting. As perks have been around for a while, companies are investing more than ever, and people’s expectations are greater, too. If you want to get 100% consensus on perks, stay within budget, save time, look our perk management software - Compt. We believe there’s a better way for companies to put their money where their culture is. If you’re interested in learning more, let’s connect. For the advocates, follow up with them and find out how they’re using the perks, how they’re affecting their life. This information can be used to reinforce the initial decision and share with other HR team members so they can see how the perks are impacting employees in meaningful ways. Talk about making your team’s hard work visible and tangible. Bring back the goals from the first section, and go through and see if you achieved your goals. What was accomplished, what wasn’t, why, and why not. This exercise is helpful for learning about your team, the response of perks, and also your goal setting. If you didn’t set achievable goals or the timelines were off, that’s okay - it can be virtually impossible to get started with goal setting if you’re doing it for the first time and there’s no historical data to rely on. For example, maybe you were running an eNPS survey for the first time and set a goal of 50, and you got 25. Now you have a benchmark to work off of moving forward. Also, you may or may not have set goals related to the metrics below, but regardless, now is an excellent time to collect some feedback and data on the program. While you’ve done a lot of the hard work up front, make your life and your team’s life easier by regularly collecting feedback, tracking it somewhere, and consider setting up a periodic evaluation. You know the metrics mentioned directly above? Keep a pulse on those on a quarterly basis to see how usage trends and sentiments change over time. There you go, seven steps to creating a world-class perks program. A lot of these steps and suggestions can also be translated to your benefits program too. If you’ve been in HR or People Operations for a while, then you’re likely aware that today’s workforce trends are shifting rapidly and perk programs are evolving along with it. Companies like Basecamp, Airbnb, Microsoft, Facebook, and Buffer are all shifting all or some of their perks to be perk stipends. The reason being, they’re exceptionally easy to develop, they scale as a company grows, they are always 100% within budget, and employees are exceptionally happier because they can buy the perks they want - instead of having them picked for them. If you want to learn more about perk stipends, uncover why companies of all sizes are using them, and see if they’re right for your company let’s connect. 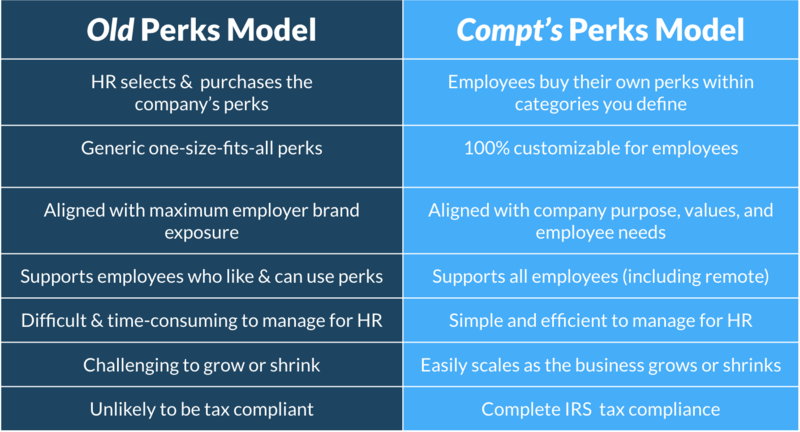 See if Compt's perk model is right for you.